Whether you’re in need of a dish rack for your cafeteria, or are looking for a convenient way to store baked goods, we have the sizes and accessories that will contribute to your space optimization, in an organized and efficient way! Zanduco carries many racks varying in slides and sizes, which are a helpful contribution to whichever type of food establishment or commercial kitchen you are running. Perfect for grocery stores, bakeries, delis, catering, buffet halls and restaurants, find the proper trays, meat lugs and accessories to fit your needs! Store your cans efficiently and simply with ease with a stainless steel can rack. 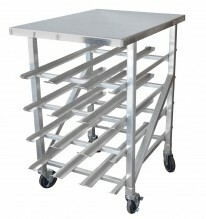 Outfitted with 5”casters, this product allows for portability as well as optimum space enhancement. Whether for storage or for customer access, a can rack limits the amount of confusion and disorder with a large amount of cans. Multiple layers of can storage allow for easy rotation of cans, so you do not have to worry about wasted or expiring products!